Several views of the Kaw Mission in Council Grove, Kansas. 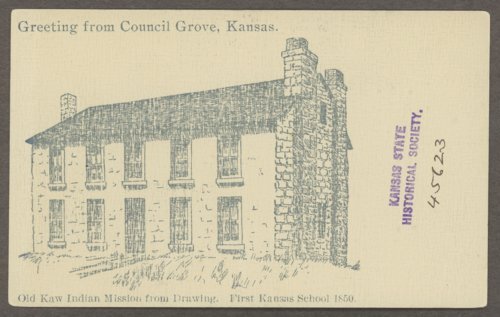 In 1846, a treaty with the Kaw (or Kansa) gave them a diminished reservation that included the site of present-day Council Grove. The treaty of 1846 had provided that the government would make an annual payment of $1,000 to advance the education of the Kaws in their own country. In 1850 the Methodist Episcopal Church South, which had ministered to the tribe since 1830, entered into a contract with the government, and construction of the mission and school building was completed by February 1851. School began in May under the direction of Thomas Sears Huffaker. Approximately 30 Kaw boys, aged 6 to 17 years, moved into the mission to live upstairs in four dormitory rooms. It was the goal of the Methodist Episcopal Church South to teach the boys academic subjects, farming, and Christianity at the Kaw Mission. Classes for Indian children were held until 1854, when the cost of maintaining the school was deemed too costly. The mission building and grounds were sold to Thomas Huffaker in 1865, and he continued in possession for 14 years. Thereafter, several individuals owned the property until 1926 when Carl I. Huffaker, one of Thomas' sons, bought the land on which the mission building stands. In 1951 the Kansas Legislature authorized the purchase of the mission property from Huffaker, and the Kansas Historical Society as trustee for the state. Kaw Mission was listed in the National Register of Historic Places in 1971 and now operates as Kaw Mission State Historic Site.